Guest Post by Melissa Crossman! A fun and exciting exhibit is in place across Bloomington, Ind. and the Indiana University campus. The Brain Extravaganza, sponsored by Jill Bolte Taylor BRAINS Inc., IU Health Proton Therapy and a host of other sponsors, aims to raise awareness and knowledge about the brain while entertaining viewers with artistic presentations. Jill Bolte Taylor, a neuroscientist and the exhibit's organizer, has a very personal reason for her interest in the brain: At the age of 37, she suffered a devastating stroke that robbed her of the ability to speak, walk, read, write, and even remember her own past. Over the course of eight years of hard work, she regained all of her mental faculties and now works to increase awareness and appreciation of the critical importance of the brain. For the Brain Extravaganza, 22 giant and anatomically-correct models of brains were placed throughout the city and campus. Each model is 5' x5' x 4', and they’re built to spark inspiration and conversation. The artistic styles painted on each brain vary, thanks to the fact that a different local or regional artist designed each one. Some of the brains were finished by individual artists, while others were completed by university art classes under the direction of an instructor. Themes are all centered on the power and the inner workings of the brain, including music, art, languages, religions, sleep and pain, psychology and more. To make sure the Brain Extravaganza is educational, the base of each attention-getting brain is inscribed with five facts about real human brains, along with a special question attached to encourage discussion. To maintain interest in brains after the exhibit is over, a mobile app is also available; this app allows users to paint their own brains and upload them to sites like Facebook for comparison with other people's paintings. Users can also put the answers to the special questions into the app to complete a quiz. Those who see these brains may wonder why they don't look quite like the drawings seen in textbooks. Specifically, they stand on a long, thick stalk that is not usually shown in models claimed to be anatomically correct. The reason for the difference is the fact that the models include 12 pairs of cranial nerves and all of the gyri. Some of these structures are associated with the brain stem, which is often shown separately in texts. 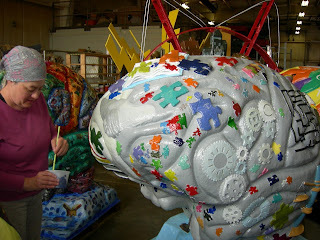 The Brain Extravaganza opened in late April and will run until mid-October. For a map of the brains' locations, go to www.jbtbrains.org/locations/. There, visitors will find a list of the positions. A downloadable PDF file is also available on the page. Visitors to Bloomington will find a vibrant city with plenty of places to eat, shop, and stay, and the Brain Extravaganza is just one exhibit to see on a walking tour of the city. Thanks to the map, visitors will be able to easily find each sculpture and enjoy the art as well as learn about the organ that makes us who we are as humans. Melissa Crossman is an avid writer who enjoys writing about health and education. She lives in Indianapolis with her two dogs.